YORKSHIRE’s Joe Root seized the moment with a perfectly-timed century in Kandy that put England in charge of an intriguing second Test against Sri Lanka. Root made 124 in 146 balls as the tourists banished expectations of an embattled second innings to finish day three with a sizeable lead of 278. It was the captain’s 15th Test century and fourth on foreign soil, with 10 fours and two sixes providing the enterprising anchor in England’s 324-9. To reach that score they had to commit full-bloodedly to their game plan, which hinged on positivity, purposeful running and a bloody-minded willingness to sweep and reverse sweep as often as possible on a spinning Pallekele pitch. Each of the first seven wickets to fall came from variations of the sweep stroke and there were six lbws but despite occasional moments of deja-vu, there was an admirable quality to their collective commitment. It is hard to argue an alternate approach would have left them in a stronger position than the one they closed on. Root aside, England owed much to Rory Burns (59) and Ben Foakes (51no). The former set the tone with a maiden and assured half-century that belied his inexperience at this level, while his Surrey team-mate added vital late runs that will provide his bowlers with a welcome comfort blanket on day four. Resuming with a 46-run deficit to clear England lost nightwatchman Jack Leach in the second over of the day attempting a stroke far beyond his means. Burns led the way, finding gaps, running astutely and accelerating with three boundaries in nine balls when the opportunity arose. In place of the anticipated crawl he was off at a canter, with the arrears wiped out inside 12 overs. England were in front by 31 when Jennings’ favourite stroke let him down, edging a reverse sweep to slip via big diversion off his chest. His was the first in a sequence of three wickets for 32 runs before lunch as Burns and Ben Stokes were both given out after mistiming sweeps. Both men reviewed in vain but while Burns had a confident fifty to take back to the pavilion, Stokes was gone for a second-ball duck. Starting the afternoon session four down with a fragile 85-run lead Root proceeded to make his move. With 26 to his name already he added 50 at exactly a run-a-ball in the next hour, forcing opposite number Suranga Lakmal into some defensive field placings then ruthlessly punching holes in them. 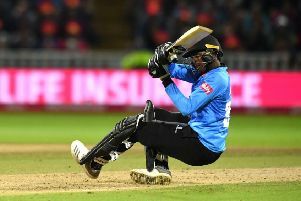 His confidence peaked when he savaged a length ball from Dilruwan Perera, clattering it for six in outright denial of two boundary catchers. Jos Buttler joined him in a stand of 74, England’s best of the match, but paid the price for failing to bail out of a premeditated reverse sweep. Instead he chased the wrong ball and diverted it into his stumps. Root found himself two short of his hundred at tea but did not suffer for the wait, guiding the second ball of the evening’s play to the third-man boundary. His celebration suggested he knew this was an innings of considerable import. Root saw England past the 300 mark before he was the latest lbw victim, mis-timing a reverse sweep against Akila Dananjaya and struck in line with the stumps. Dananjaya emerged with figures of 6-106, bowling Sam Curran for a golden duck and winning decisions against Moeen Ali and Adil Rashid, but in among his wicket-taking deliveries he offered up plenty of cheap runs. When bad light stopped play ahead of schedule, Foakes had just reached his half-century with a six, a potentially critical cameo that threatened to take Sri Lanka’s chase from tricky to improbable.